Panchratan translates to ‘five jewels’. Panchratan dal is an exotic amalgam of five lentils that are cooked in a delicately spiced onion-tomato base to a creamy consistency. A cold weather, crowd pleasing favorite, works great as a thick soup too other than serving as a comforting accompaniment to roti or rice. 1 In a pressure cooker, add 2 cups of water and all the five lentils/dals and pressure cook upto 3 whistles. If cooking over stove top, cook till the dals are almost cooked. Mash the dals lightly. 2 Heat oil in a heavy bottomed vessel, add green chilies and ginger and stir fry for 15-20 secs. Add the chopped onions and saute for 5 mts. 3 Add red chilli pwd and turmeric pwd and combine. Add the chopped tomato and saute for 5 mts. 4 Add the pressure cooked dal along with salt and combine. Add a cup of water and lemon juice and cook on slow to medium flame for 15 mts without lid or till you get the consistency of your choice. 5 Heat ghee in a small pan, add the cumin seeds and as they splutter, add the hing, crushed coriander seeds, red chilies and garam masala pwd and turn off heat. Pour this to the dal and combine. 6 Garnish with chopped coriander leaves. Serve with rotis or white rice. dal is such a comfort food at my house..n more off mixing altogether sounds interesting and yummie..thanks for sharing this..have a nice weekend..tk care! just simply superb! no other words for this. 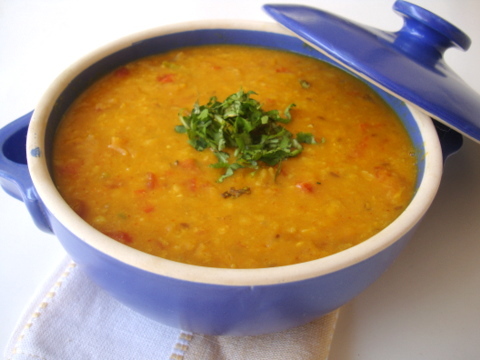 I love this dal… I make a similar version of it. I usually eat like a soup to cut out the carbs. The picture makes me want to dig into it! A feast for the mouth, very easy to prepare and very healthy too! I made this for dinner and its really delicious. Thank you for posting this. If you bake butter madeleine cookies (french cake cookies), could you please post the recipe? Thanks! 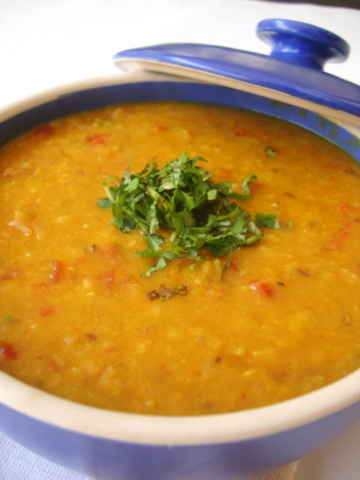 Dal is the most yummiest dish…I can eat it everyday. We have a similar Sindhi dal preparation with 3 dals. I love your Dal recipe. Do you have khandvi recipe? such a nutritious dal..very beautiful clicks. nice recipe with a traditional name…will try out soon.Looks yummy! Thanks for the jewel Sailu.I was seriously looking out and tried a couple of recipes on the internet after trying at a Marwari friends house.I thought it was a Rajastani speciality but wasn,t sure .Now I have your recipe to suit my Andhra palate. This looks absolutely delicious! I tried my hand at this just this past weekend and mmmmmm is all I have to say. Usually when I want this dish, I just buy it at the supermarket from this brand called Tastybite. Their version is called Jodphur Lentils and it only takes 90 seconds to make. It’s super delicious and my kids love it. That’s when I’m feeling super-lazy or have absolutely no time to make dinner or lunch. Otherwise this recipe looks great! If you’re interested though, I buy the ready-made version at Whole Foods, Trader Jos, or at my local supermarket, but I know that TB sells their products on their website and Amazon too. Keep on cookin’! i have been wanting to write to you for sometime now. I have recently discovered your blog and since then have been a regular visitor. Your recipes are very nice – easy to comprehend and amazing pictures. I have tried your pasta dishes and my daughter loved it. I am going to try this Dal tonight for dinner. Thank you so much and keep it going ! Hey, am planning to make this tom. Do I need to soak the lentils the previous night? No need for overnight soaking, Sheba. Soak the lentils for 30 mts before pressure cooking. DE-licious!! Thank you for sharing the recipe. I love your blog, it’s a great way to discover Indian food, more tasty and healthy than at the restaurant!